Ok, so I’m pretty obsessed with this butternut squash soup. In the past month or so, I’ve made three full batches. For myself. But when the weather’s as dreary as it’s been these days, soup really is the best comfort food. I eat it by the bowlful or if it’s super gloomy outside, with some grilled cheese sandwiches (dill havarti on pumpernickel, it’s the best). Use the best, freshest ingredients and you can’t go wrong. The soup does require some prep work and chopping but it’s well worth it. I freeze half the batch so that it’s always there whenever my butternut soup craving hits. Mmm… I love winter! (1) Heat a large Dutch oven over medium-low heat, melt the olive oil and butter. Add the onions and sauté for about 5 minutes until translucent. (2) Add the chopped apples, butternut squash, and garlic. Saute for another 10 minutes until the squash begins to slightly soften. (3) Pour in the broth then add fresh thyme leaves (discard the stems) and cayenne pepper. 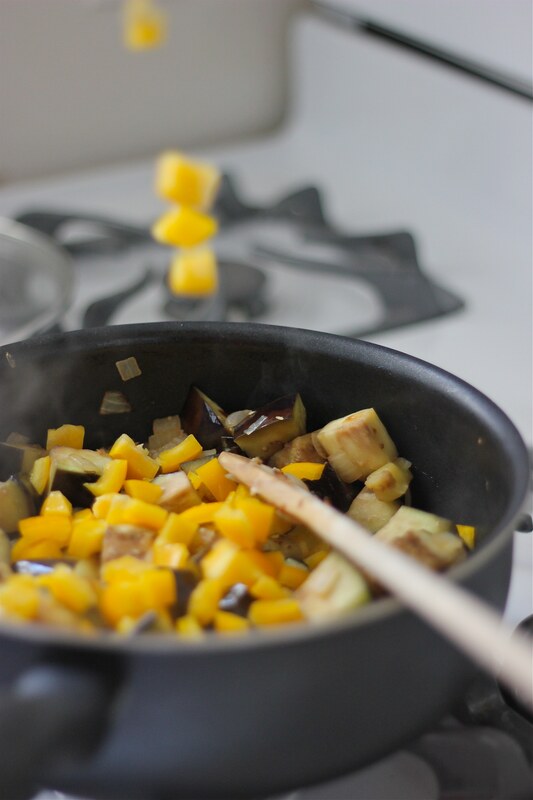 Raise the heat to medium high and bring to a boil, reduce to medium-low heat and simmer for 20 minutes or until the squash is tender. Remove from heat. (4) Puree the soup, in batches in a blender until smooth. Be very careful when pureeing the hot mixture to start blending slowly and let the steam vent. (5) Return to Dutch oven and season with salt and pepper to taste. Bring back to a simmer and stir in the half and half for a richer consistency (I usually find it doesn’t need it though). So admit it… you had no idea what ratatouille was until Pixar introduced us to that adorable movie about it. At least, I didn’t. I have a particular soft spot for the film as I first saw it with my little brother Ben on one of our ritual sibling date nights (back when he still thought I was cool). Afterwards, we went to Red Robin (his pick) and I paid… hmph, now that he’s taller than I am, it’s time for payback. After the movie though, I started seeing ratatouille everywhere! 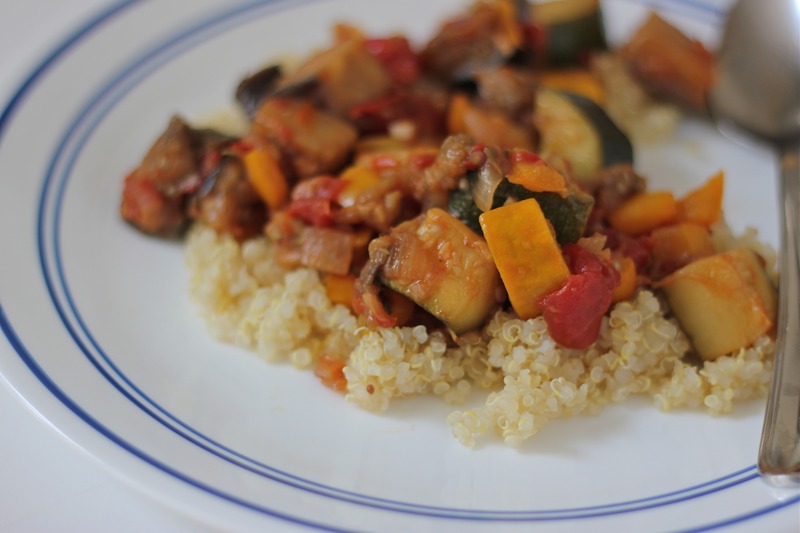 A classic Mediterranean dish, ratatouille is not only flavorful but really healthy (vegan) and easy to make. 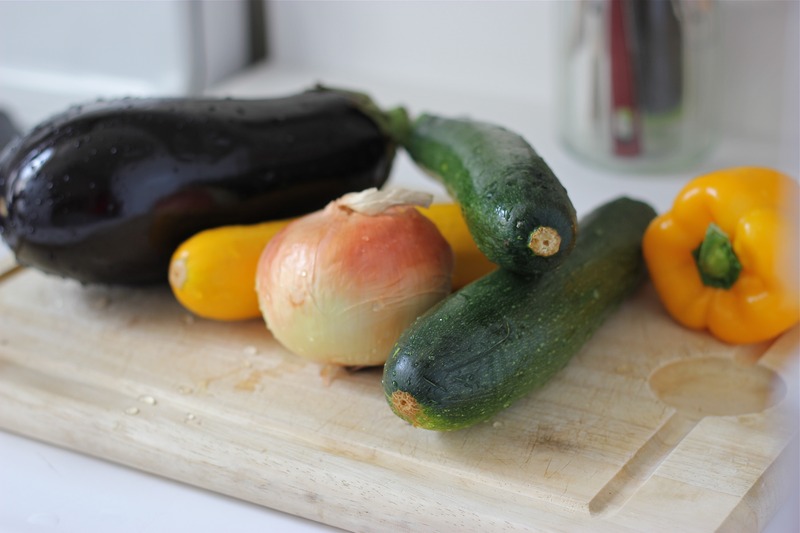 I love all the vegetables that go into it: eggplant, zucchini, yellow squash, bell peppers, onions, garlic, and tomatoes. A simple dish like this does indeed prove that it’s true, ‘Anyone CAN cook!’ (baking, however, is still strictly for the pros). This dish also tastes great both hot and at room temperature (even cold) which makes for nice leftovers or packed lunch. My version is the traditional rustic dish, but to see the ‘movie’ version look at this cute take on Smitten Kitchen. I may have to make it with my brother next time I’m home. (1) Set a large 12-inch sauté pan over medium heat and add 1 tablespoon olive oil. Once hot, add the onions and garlic to the pan. Cook the onions, stirring occasionally, until they are wilted and lightly caramelized, about 5 to 7 minutes. (2) Add the eggplant, thyme, and rosemary to the pan. 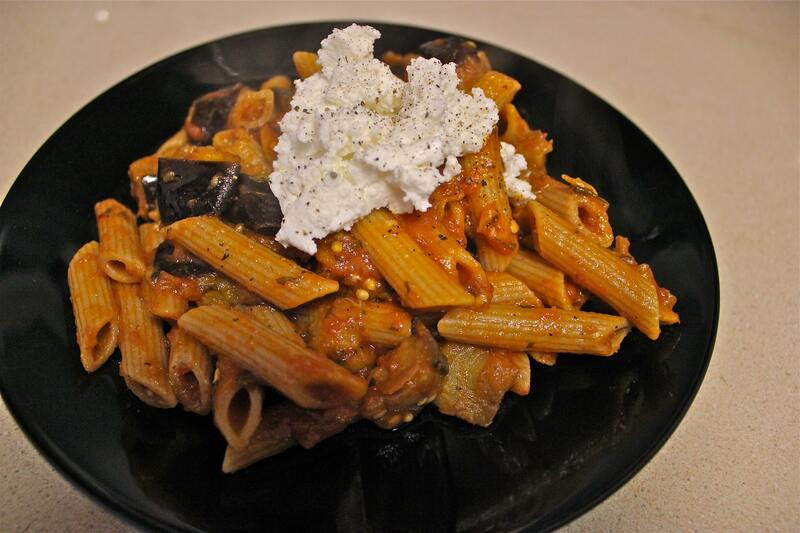 Drizzle another tablespoon of olive oil and continue to cook, stirring occasionally, until the eggplant is partially cooked, about 5 minutes. 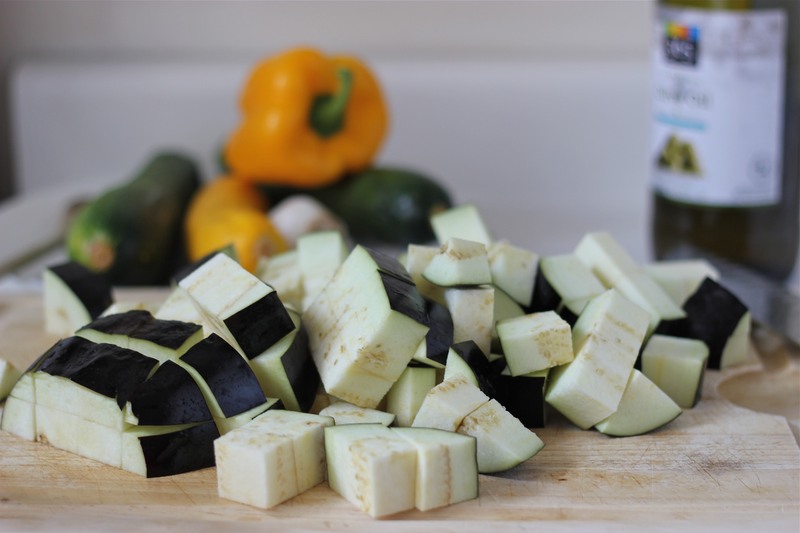 (3) Add the diced bell pepper, zucchini, squash and garlic. Drizzle over another tablespoon of olive oil and continue to cook for an additional 5 minutes. (4) Add the canned tomatoes and salt and pepper, to taste (about 1 teaspoon salt, ½ teaspoon pepper for me), and cook for a final 5 minutes. 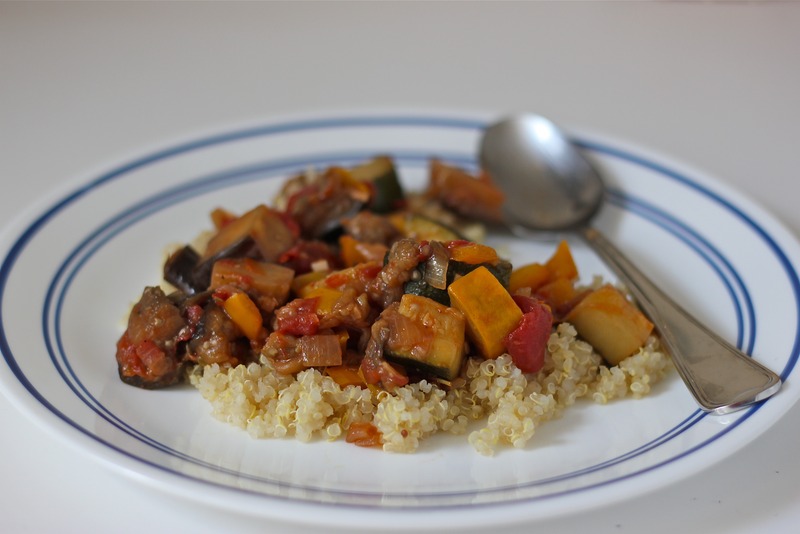 (5) Stir well to blend and serve over a bed of cooked couscous or quinoa, either hot or at room temperature. Note: Make sure your pan is large enough. I may or may not have had to divide my ratatouille halfway through cooking because my pan was overcrowded (ok, I definitely did). You want the vegetables to lightly sauté, not steam. Besides a potato chip. Or a tortilla chip. Pita chip, poker chip… oh, chocolate chip! So well yah maybe kale chips don’t exactly scream mm YUM, yes please! but they’re actually quite tasty, crispy snacks. If you like roasted nori sheets (which I love) then you’ll probably like these. They really are a nice go-to fix when you’re in the mood for a salty snack. In fact, not to brag, but they were quite the success at the Fourth of July party I went to last night… just spreading the gospel of kale chips everywhere I go. Like a vegan Jesus. Again, not bragging. Not to mention they’re so much healthier than most other snacks that go crunch (I’m lookin’ at YOU, salt & pepper kettle chips!). 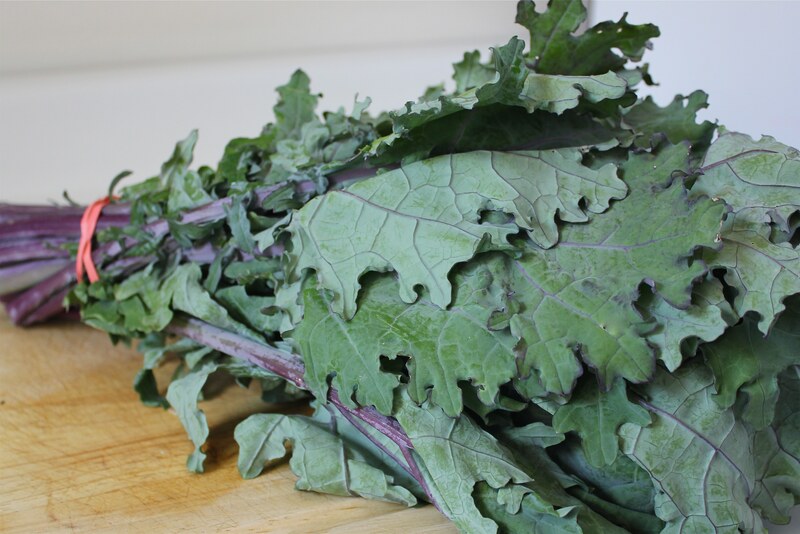 Packed with beta carotene, vitamin C and K, calcium, and definitely the trendiest green right now. 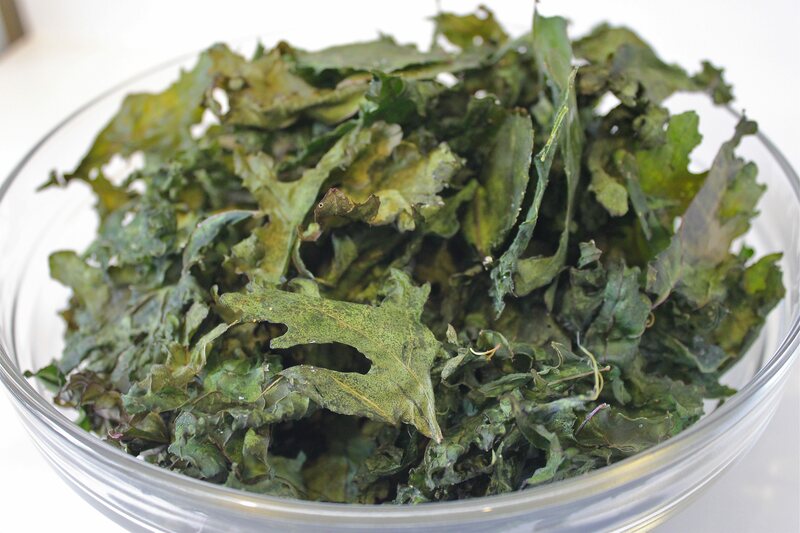 So indulgence wise, there really is no better chip than a kale chip. I love oatmeal. 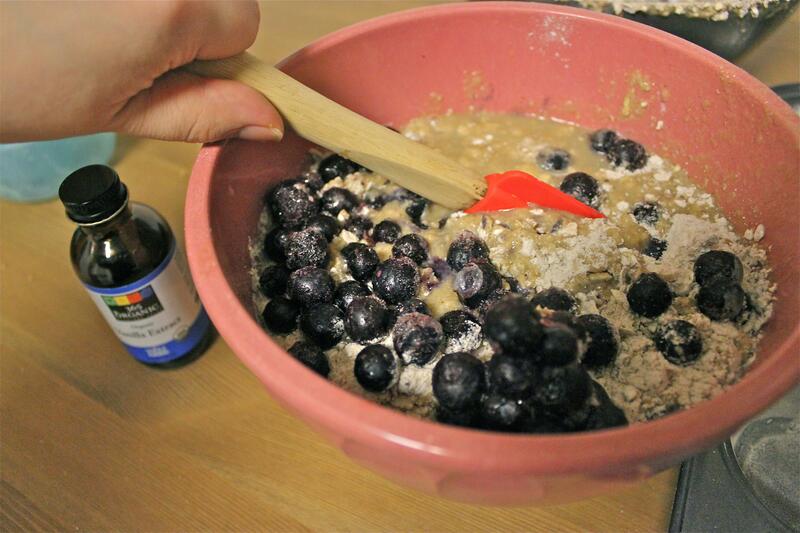 Apple cinnamon, maple brown sugar, blueberry… and my love of oatmeal extends to other forms such as in this and this. But when the weather gets sweltering outside, sometimes the last thing I want for breakfast is a hot bowl of oatmeal. That’s why overnight oatmeal is perfect. There’s no cooking involved and it’s eaten cold. I’ve had my family try these to mixed responses (I think it’s a temperature thing) but I absolutely love them. MmMmm more oats for me! 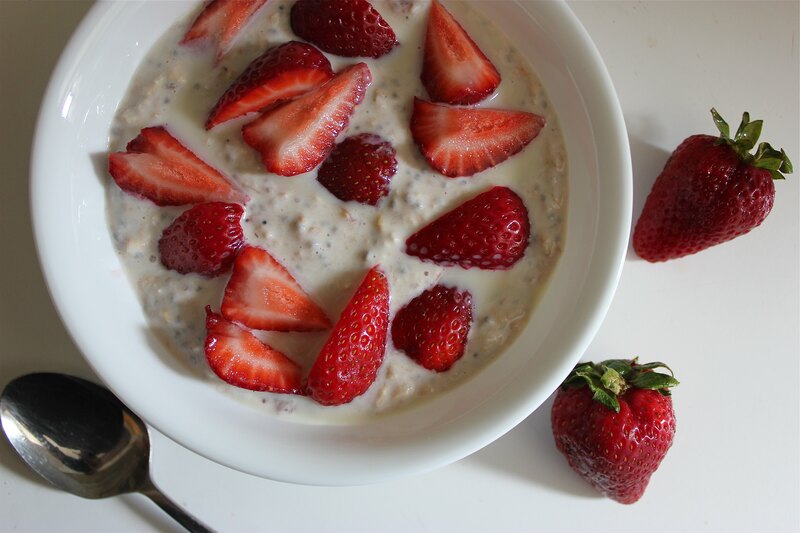 It also incorporates one of my new favorite ingredients: chia seeds. 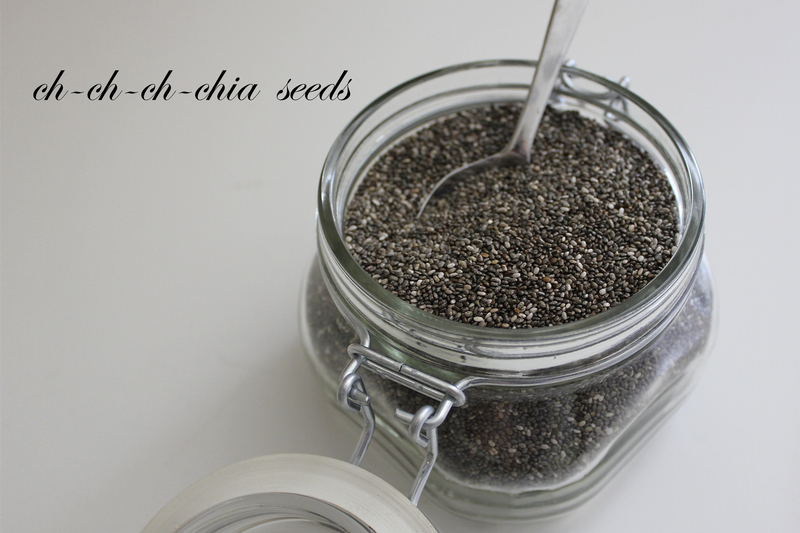 Yes, chia seeds as in those used for Chia Pets. But it turns out that these seeds are incredibly good for you. They’re full of omega-3 fatty acids, iron, and calcium. And since they absorb lots of water, they help you feel fuller. Fantastic, right? 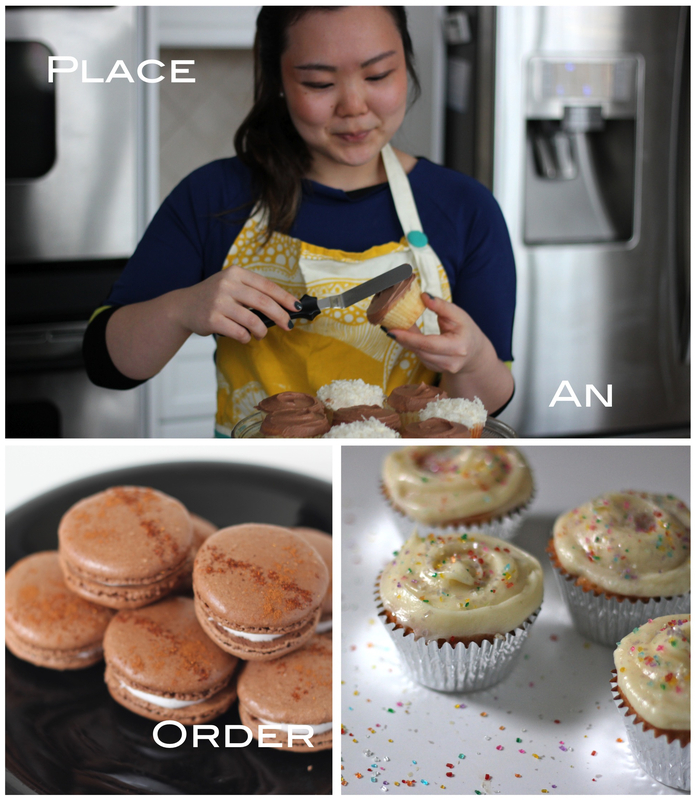 I’ve been sprinkling them on top of everything from pasta to stirfry to ice cream! I buy mine from the bulk section in Whole Foods but you should be able to find them in most health food stores. Ch-ch-ch-check ’em out. I’ve never really written a ‘restaurant review’ but I felt this restaurant was especially noteworthy. I first heard about Souen, a restaurant that specializes in vegan, macrobiotic food, in an article featuring Alicia Silverstone. Now, say what you will about her eating habits when it comes to feeding her child, but I’ve been a big fan of her overall vegan, healthy lifestyle. I even have her cookbook, The Kind Diet. S: What place do you suggest? 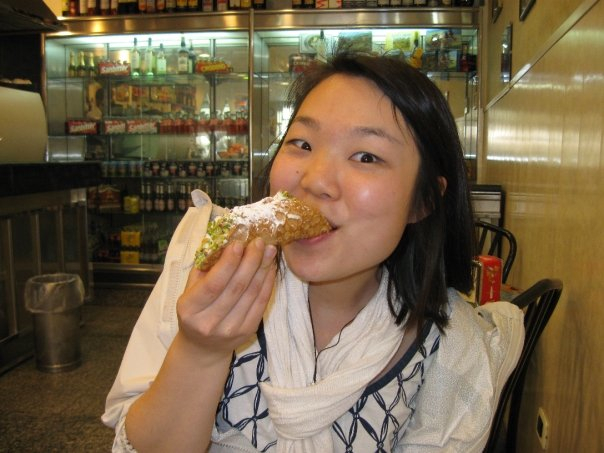 M: There’s a vegan macrobiotic restaurant Souen that’s super healthy but really good, I promise! But honestly, everyone I’ve taken there has really enjoyed it! I first went for lunch with my friend Anne Larimer (who is gluten-intolerant) and the second time with Sonia and our friend Mythili (all of us are on-off vegetarians/vegans). 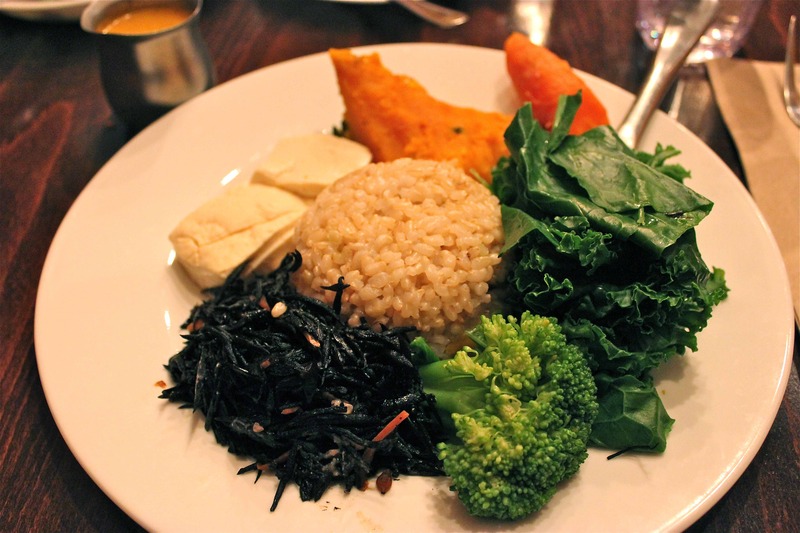 The first time, I ordered the Macro Plate (shown above) which I would recommend getting with the carrot dressing. The second time, the three of us had quite the feast! 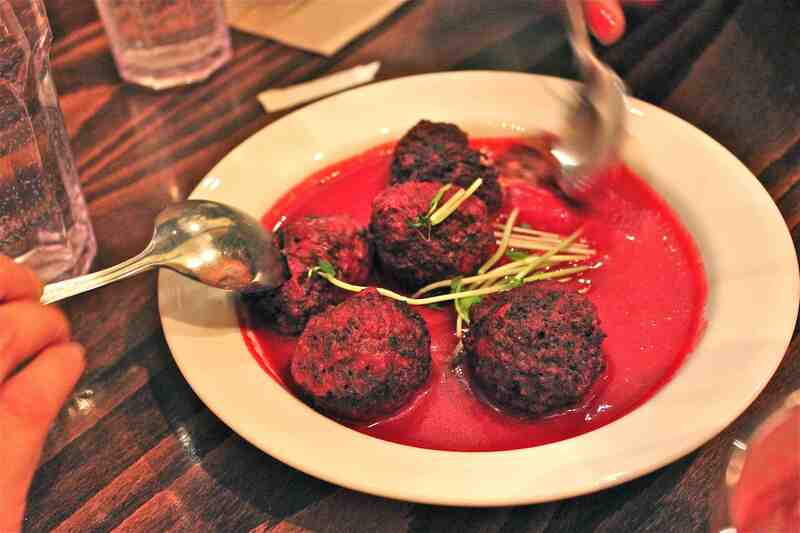 Started with Seitan ‘Meat’balls… probably the best thing I’ve had here and definitely a good transition for those who are typical meat-eaters. It’s the One Year Anniversary of my blog country mouse. city life.! Life is definitely much different now than it was a year ago. I live in a different city, I got my first real job, and I still love Beyoncé. 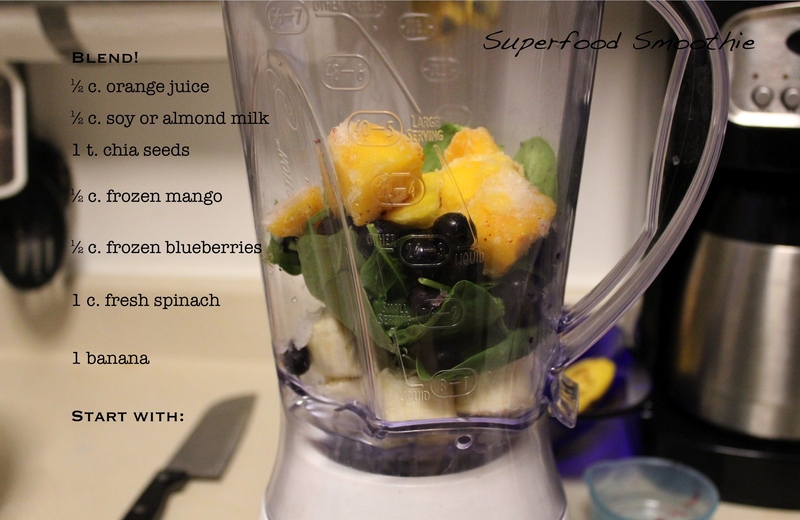 So I thought it’d be the perfect cause for celebration to introduce my favorite smoothie recipe! Even more so now that the weather has warmed up. 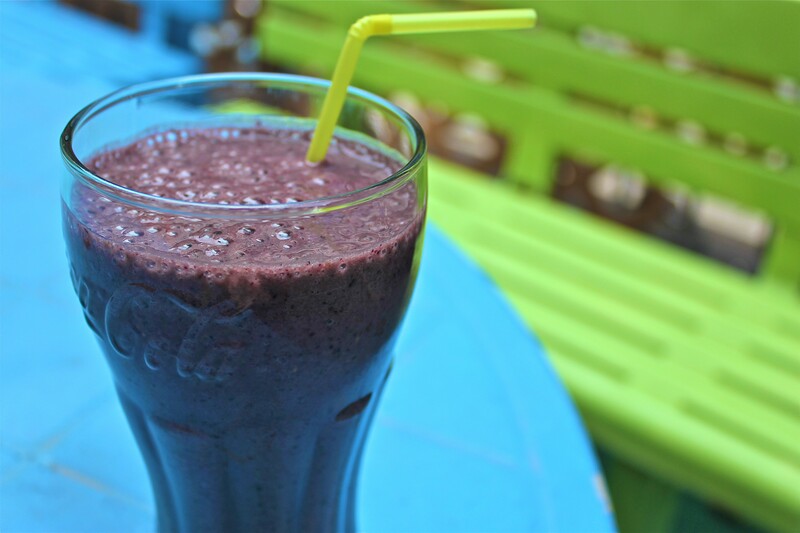 I call this my ‘Superfood Smoothie’ cause it’s full of antioxidant-fighting ingredients like blueberries, chia seeds, and spinach. It sounds really gross, putting spinach in a smoothie, but I’ve been doing it for years. Spinach is so mild, you can’t taste it once it’s all blended up but you really wanna make sure it’s completely blended (bits of spinach in your smoothie is not appetizing). I’ve been drinking this almost every day and love it! Thanks to all my friends and followers for making this blog such a wonderful, fulfilling experience this past year. 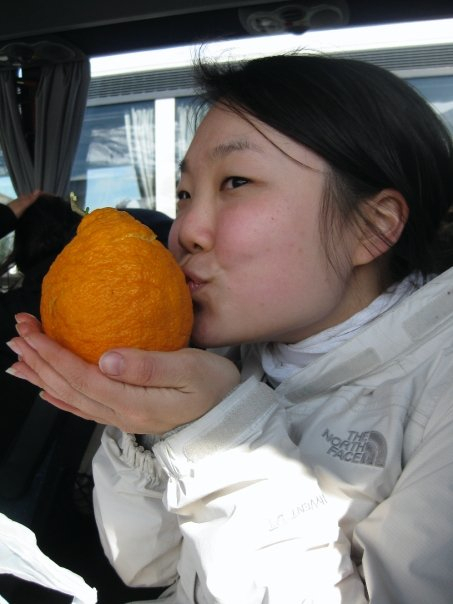 Cheers to many more blog posts to come! Yes, we all know it’s ‘the most important meal of the day’ but… do you eat breakfast? I admit that for a long time, I did not. Mostly because I am not much of a morning person. Still not. When I did start eating breakfast, it was more like, grab a Special K bar before heading out the door. Even now, I’m not a huge breakfast fan unless it involves my sister’s oatmeal pancakes or a nice crab cakes benedict (anything with poached eggs really). The issue with breakfast is I want something that’s energizing, not too filling, and of course yummy. 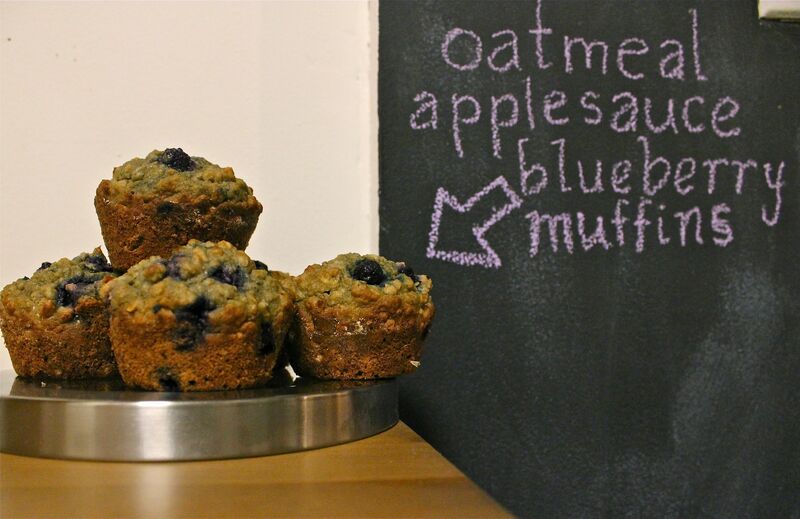 These days, my very fancy breakfast usually consists of anything that’s easy to grab-and-go like these oatmeal applesauce blueberry muffins (which I waxed poetics about in my NY Diet). 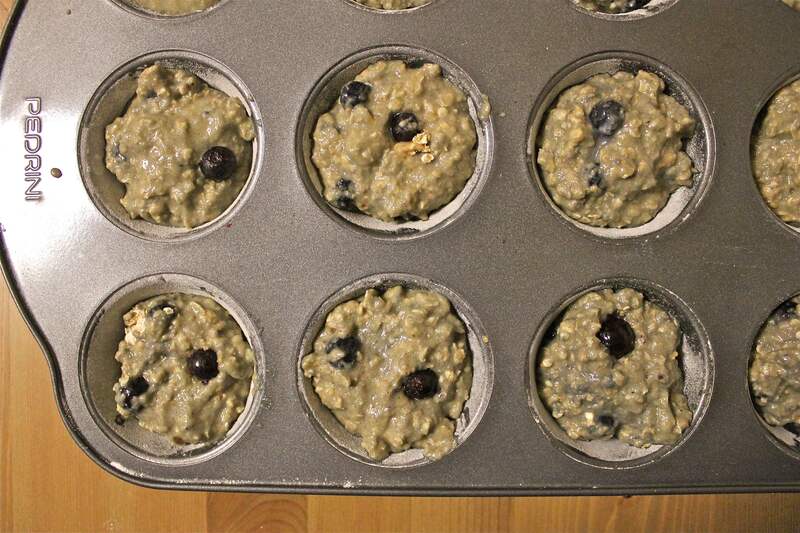 These muffins are the perfect on-the-go, nutritious breakfast. Seriously, I love these. I even eat them as a sweet treat after dinner. Bake a batch over the weekend then refrigerate them so you’ll be sure to have breakfast all during the week… if they last that long. (1) Preheat oven to 375° F. Line a 12 cup muffin tin with paper cases or spray with nonstick cooking spray. (2) In a large bowl combine flour, oats, baking powder, baking soda, salt and cinnamon. 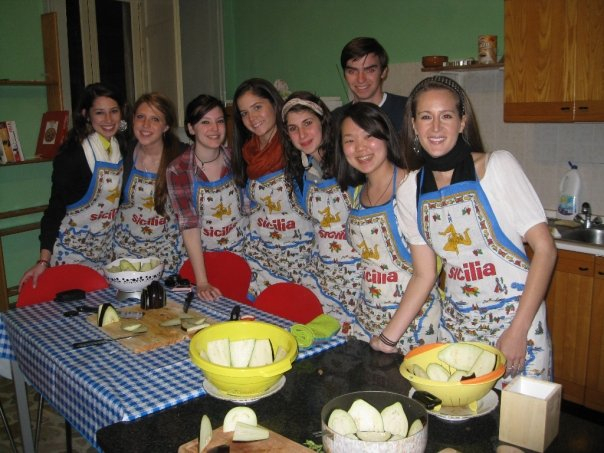 (3) In a medium bowl whisk together the applesauce, milk, sugar, oil, egg and vanilla. 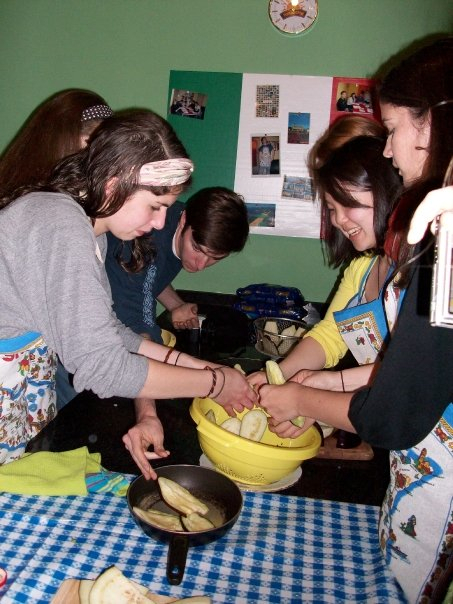 (4) Make a well in dry ingredients and add applesauce mixture. Stir until just moist. As with most batters, it’s better to not overmix; a few lumps of flour are fine. (5) Fold in blueberries. Fill muffin cups 2/3 full (about ¼ cup). (6) Bake for 16-18 minutes. Let cool in pan for 5 minutes before taking out and cooling on a wire cooling rack.